NDL Keg and Country Malt Group have announced a new strategic North American partnership. NDL Keg and Country Malt Group have announced a North American strategic partnership. NDL Keg, a leading global supplier of stainless steel kegs and casks, today announced a new strategic North American partnership with Country Malt Group. The partnership combines NDL’s keg expertise and supply of high-quality containers with Country Malt Group’s strong relationships with North American brewers and industry-leading distribution and sales network. NDL’s standard U.S. kegs and casks will now be available through Country Malt Group’s sales network and stocked in five U.S. warehouses — Champlain, New York; Chicago, Illinois; Dallas, Texas; Oakland, California; Vancouver, Washington — and will be available very soon in two Canadian locations. 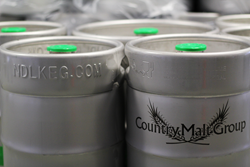 Stainless steel kegs and casks are the latest addition to Country Malt Group’s wide array of brewing ingredients and equipment, that includes malts/grains, hops, yeast, cooperage and more. Headquartered in the U.S. in Detroit, Michigan, NDL Keg is a leading global supplier of stainless steel brewing containers. NDL has been distributing high-quality, stainless steel kegs, casks and growlers to craft, regional and major breweries in North America since 2010. More information on NDL can be found at http://www.ndlkeg.com. A division of GrainCorp, Country Malt Group has grown to be one of the leading providers of quality ingredients and supplies to the Craft Beer Industry. Spanning the United States and Canada, CMG has eleven distribution centers located strategically across North America. More information on Country Malt Group can be found at http://www.countrymaltgroup.com.